For Robotics, to program the robot, we use Microchip's MPLAB IDE with the MPLAB C18 compiler. Unfortunately, those two only run on Windows. So to use them if your primary OS is Linux, there are three choices: boot to Windows, use the WINE compatibility layer, or virtualize a full Windows installation from within Linux. My first choice was to use WINE. Unfortunately, WINE is pretty slow, annoying to use, and unreliable (the MPLAB IDE install failed for me). So I booted to Windows Vista and installed the tools there. They installed after a little fiddling with compatibility options, but booting to Vista every time I want to make a change is a pain, especially considering how slow Vista is to boot. So my last option was to virtualize Windows (here's a tutorial if you're interested). Luckily, my laptop's CPU supports hardware virtualization extensions (it's an Intel Core 2 Duo T7200) so full virtualization should be pretty fast—around 80% of native performance. I installed the Ubuntu qemu and kvm packages. Qemu is a basic open-source emulator that can run any x86 OS. It usually runs pretty slowly, at around 10% of native. KVM is the Linux kernel module that takes advantage of the CPU's virtualization extensions to speed things up significantly. 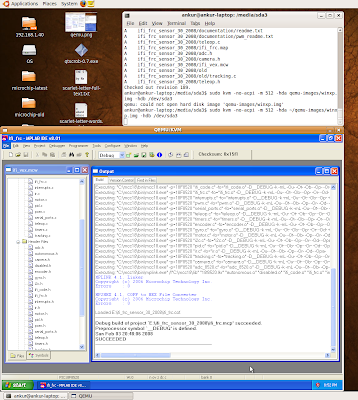 Once those two packages were installed, I modprobe'd the kvm and kvm_intel modules and created a 3-gigabyte disk image. I installed Windows XP onto it (we have 3 or 4 copies of XP lying around, and since we either replaced those installations with Ubuntu or Vista, the copies are available for me to use). I backed up the fresh image onto an external drive and installed Office XP (same thing as above, we have a few licenses) and the MPLAB tools onto the image. I just bothered to read this. Funny, I understood more than I thought I would xD.